In January 1975, Popular Science magazine ran an article on the first consumer computer: the Altair. Ed Roberts, the founder of the company making the Altair, ran ads in the magazine for pre-orders of his device for a then-shocking $400. He needed to sell 200 to break even, but ended up selling over 2,000 instead. There were many challenges in actually delivering the device and plenty of upset customers due to delays and limited functionality, but it marked a key moment at the start of the PC revolution. A small company named Microsoft would work closely with them to run BASIC software on it and many other hobbyist computers would emerge in coming years. Today, the chosen pre-order crowd-funding source is Kickstarter and once again early adopter backing is funding a new revolution: consumer 3D Printing. A quick search shows there have been over 75 projects posted on Kickstarter related to 3D printing. Of those, 5 are currently active and 35 have been funded (a 50% fund rate on completed campaigns). Since the start of 2013, 38 of these projects have launched, with 17 funded and 16 failed (the other 5 are still active). Some projects have even raised millions of dollars like the Buccaneer ($1.43mn, 3,520 backers), RigidBot ($1.09mn, 1,952 backers) and the 3Doodler ($2.34mn, 26,457 backers). All 3 of those projects launched in the last 6 months. So with all this funding, how is it affecting those that post? To find out, I spoke to a variety of companies currently crowd-funding, planning to crowd-fund and already completed both successful and failed campaigns. The first thing that stood out for all the companies that I spoke with was how important preparation was for their projects. No matter how much time they spent to understand the work ahead, there were always surprises and new challenges. Those that hadn’t figured out the finer details of their project before launching the Kickstarter were significantly more likely to fail in funding. The preparation also extends to marketing. Designer Todd Blatt, creator of the funded Google Glass project, GlassKap, observed, “[Many projects] think you just make a Kickstarter and people come. You can’t count on that.” I asked companies what the ratio was for backers that came organically from Kickstarter versus their own efforts and it was usually 60% their efforts. Getting ahead in their marketing meant thinking about press and forums to post to at launch and building lists in advance. DeltaPrintr, a delta-style RepRap design launching in the fall, is smartly already collecting signups on their detailed website which explains their product’s benefits and differentiators. Like a good angel investor, many of the backers on Kickstarter add more value than just their money. File2Part, a 2012 campaign for better 3D printing software, found that about 15% of their backers were tremendously helpful in debugging their beta release of their software as the backers were also software engineers. Meanwhile, DGlass3D, a current campaign to create a better dual extruder for 3D printers, has already gotten great feedback from hobbyists and hackers backing the project. With so much traffic and attention given to many of the Kickstarter projects, it can also be a signal to those in the market that your company is someone they should work with. Volumental, a current campaign for browser-based 3D scanning and printing, has received numerous business opportunities because of the attention around their Kickstarter. They’ve also turned the campaign into press that extends beyond the project and helped raise the visibility of their company. Even more impressive is how a failed campaign by 3Dagogo actually inspired them to start their business. Their May 2013 campaign to sell 250 useful 3d printing designs did not fund, but many members of the 3D community reached out to them saying they were working on an important problem. That was all the encouragement they needed and they’re now working towards a site launch. While Kickstarter tries to manage backer expectations on projects, there are still times when users can be difficult or even angry. In the case of DGlass3D, some potential backers were upset with the way they planned to handle their IP for their design (a hot button subject in the 3d community). After some passionate discussion, it led to DGlass3D changing their IP plans and updating their description of it on their Kickstarter page. Stories like File2Part’s is why when I spoke with DeltaPrintr, they told me they are trying to have everything in line, even suppliers and manufacturing, before they launch their campaign. They hope that Kickstarter can simply then be the platform to connect with their first customers and add the funding needed to fulfill orders with their manufacturer, without delays and drama. It would be great to say that every campaign that funds on Kickstarter has a fairy tale ending of delivering on time and launching to ongoing success. Unfortunately, we know that’s far from true. Going beyond the disappointment of the end user who may receive their orders late, below their expectations or sadly, not at all, companies can face struggles as well. After the costs of making his video, marketing and adding the cost of printing the objects, 3D designer Todd Blatt found he didn’t make any money on his funded GlassKap project. He did tell me, he will likely do another project in the future based on his learnings from this one. File2Part, who had the aforementioned firmware challenges, actually hired a consultant to help them with those issues. Unfortunately, the cost of that consultant exhausted all their funds raised which led them to take a loss overall on the project. The stories of success on Kickstarter have spread far and wide, which is why all of the people I spoke with turned to the platform for their company. However, it’s important to realize that like any website, there’s a specific audience that is generally found on Kickstarter. They are often consumers, with a bit of an early adopter and hacker edge to them. Some will back many projects, showing more allegiance to Kickstarter than any of the individual companies they back. 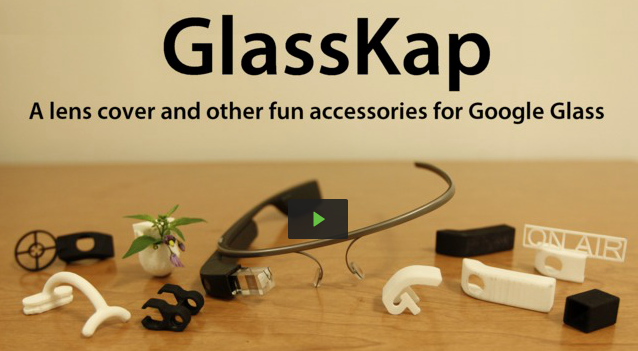 This proved a solid audience for GlassKap, as Todd was able to fund his project even though there are only 10,000 Google Glasses in the public now. Similarly, the consumer-friendliness of Volumental’s browser-based scanning also funded well with the Kickstarter audience. Meanwhile, 3Dagogo’s 250 3D print designs failed to fund, as many Kickstarter backers are still waiting for their Kickstarter-backed printers and many of the hackers and hobbyists with printers already have proven to be less interested in the pre-made designs. And while File2Part did fully fund, they found many of their backers were not who they were hoping for; their goal is to build an industrial-grade 3D printer to sell and were not expecting to have so many consumer printers to support. Kickstarter is an amazing platform for discovery and funding of great projects. Like the pre-orders of the Altair, it doesn’t always go as planned, but great things can come of it. Two 20-somethings from Harvard moved to New Mexico to write the software for the Altair. We may not have had Microsoft today if early adopters of the Altair hadn’t sent those checks to get their first consumer computers. What new industry titans will come from crowdfunding like Kickstarter and the ecosystems they help create? Carl Douglass of DGlass3D, an active campaign for dual extruders for your printer. Caroline Walerud of Volumental, an active campaign for in browser 3D scanning. Todd Blatt of Custom3Dstuff, a funded campaign for 3D Google Glass accessories. Eugene Giller of File2Part, a funded campaign for better 3D printing software. Drew Taylor of 3Dagogo, a failed campaign for 250 useful 3D objects. Shai, Andrey and Yasick of DeltaPrintr, a future campaign for a Delta style 3D printer.